I received my Insta360 Air camera in the mail today. I was one of the backers of an Indiegogo crowdfunding campaign for the Air, so mine arrived ahead of the official release date. As you can see in the photos (below), this diminutive 360° camera plugs into any Android phone directly via the micro-USB port. It has no battery of its own. Instead, it draws power from the phone. Stitching and processing is handled by an app freely available from the Google Play Store. For such a small device, the Air captures surprisingly high quality 360° photos and video (Photos: 3008 x 1504 (3K), Video: 2560 x 1280 (partial model support 3008x1504) at 30 Frames per second (FPS)). But the real party piece is the 360° livestreaming capability. I'll be testing that in the next week and I'll post links. The Air also comes with a flexible stalk that connects to your computer's USB port, allowing it to be used as a panoramic webcam. I haven't seen this feature on any other 360 camera before, so I'm quite keen to try it out. Unfortunately, it won't work with my MacBook Pro just yet — the driver is not yet available for OSX. There's no estimate from Insta360 for when that might be available. I'm a fan of the Air's design, especially the ability to stow it safely in a pocket. It tucks neatly inside its silicone rubber holder, protecting both lenses and the otherwise damage-prone male USB connector. *UPDATE: Insta360 announced that they will be adding software-based realtime image stabilization to the Insta360 Air! Even though many 360 cameras are equipped with gyros and other sensors to help stabilize video output, it's usually not enough to deal with all types of unwanted motion. Facebook will automatically stabilize 360 videos uploaded to their site, and for certain types of content, it works well. I've tested this recently to understand the limits of Facebook's software, and you can observe the results below. The first video was taken during a recent protest march in Ottawa. I mounted the camera on a telescopic monopod, and held it above my head. It works rather well, although there is an odd floating effect that I don't see in the original. I've looked at other videos when the operator is walking with the camera on a monopod something similar, and for the most part, the algorithm does a good job of damping out unwanted motion. However, it's not adept at stabilizing everything. In the next video, take note of the odd stretching distortion as Facebook attempts to compensate for the swaying motion of the monopod as I skate along the frozen Rideau Canal. The obvious solution would be to mount the camera on a gimbal. There are many options for conventional cameras that cater for all types of users, from amateurs all the way up to professional videographers. You can buy gimbals that can be held, mounted on your body or on a bike, car, drone or just about anything. But for 360 cameras the options are few at the moment. A standard 3-Axis gimbal won't work with my Samsung Gear 360, the Nikon Keymission, or any other 360 camera because they work on the principle that there is one lens and it faces in one direction. The second lens would be blocked by the gimbal. 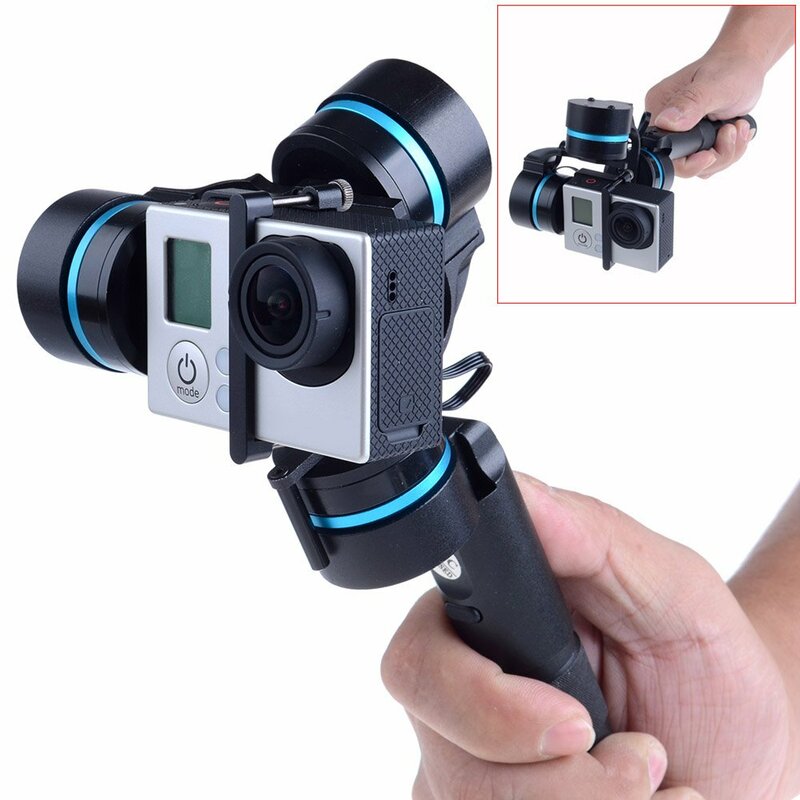 There are some gimbals available for 360 video cameras, but most are very expensive. That said, some inventive types have come up with clever low-cost solutions. One in particular suits me because it will work with the Samsung. It consists of a 3D-printed accessory (see red component in the photos below) and a counterweight. According to it's French creator, Denis Fritsch, the adapter will only fit the the Zhiyun Smooth II. I was lucky enough to find a used Smooth II for about half of the retail price on eBay. I've also ordered the adapter from Denis, and I expect to see both arrive next week for testing. I'll post the results here as soon as I can. There will be gimbals hitting the market later this year that are intended specifically for 360 cameras, but until then, I hope this will do the job. Denis demonstrates his solution below (French only). One of the challenges with capturing 360° photos or video is lighting, especially given that many of the consumer-grade cameras currently on the market have small sensors and don't work well poorly lit spaces. Early adopters have investigated different ways of adding light without the lights themselves becoming an unwanted feature of the image. One approach is to hide lights in the blind spot of the camera. That means the unit needs to be small and relatively powerful. Mic Ty of 360rumors.com bought a cheap, flexible, clip-on reading light and demonstrated that it is possible to improve the lighting in areas immediately surrounding the camera. Inspired by his approach, I've purchased one of these lights and I've spent some time testing different configurations. The clip also contains a rechargeable lithium-ion battery, so for most applications it doesn't need external power sources, although you can use the charge cable to add a bigger battery or plug it into an AC outlet with the included adapter for longer duration video, such as live streaming. Oops! The clip doesn't fix securely to the monopod and slides down. It's also in a horizontal orientation that can make it visible outside of the camera's blind spot. While the light helps to fill in the shadows, I'll need something more powerful for bigger spaces. But for the price, it's a valuable addition to my toolkit (An excellent challenge for my industrial design friends at Carleton University!). This time with flexible ties to hold it in place. One of the running gags in Amazon's new motoring show, The Grand Tour, is a camera drone that is shot down or crashes at the beginning of each episode. Drones are shot down more often than you think. Just ask the folks from Digital Smoke Signals, who are monitoring the protests at Standing Rock. And they crash. All. The. Bloody. Time. After rebuilding the drone following the last mishap, and FINALLY getting the landing gear to automatically retract, I mounted a Walkera G-2D camera gimbal on it and flew along a section of the Rideau River in Ottawa, Canada. What I didn't think to calculate was the impact of wind over the river as it doggedly stuck to a rather convoluted flight plan I'd programmed into it earlier. This meant it was running out of charge long before completing the flight. I'd configured a failsafe for just such an event, setting the drone to return to launch if it got below a certain level of battery reserve. The trouble was, I didn't set the default altitude for RTL. Consequently, the drone went streaking back towards the launch point at about 10 metres over the water and straight into an ancient and very large oak. That, as they say, was that. Thankfully, it landed on a thin sliver of shoreline and not in the water. But it's as broken as the Paris Climate Agreement, post-Trump. I was able to salvage the memory card from the camera. It's not 360 degree video, as you will plainly see. I'd resurrected a Xiaomi Yi action camera from my Brahma Duo 360 rig, hoping to compliment my 360-degree photos and video with some more conventional multimedia. ​Miraculously, the Cheerson CX-20's electronic innards have survived, so all I need to do is fit them into a new plastic shell. Since I've got the thing dismantled, I've decided to modify the flight controller with a 3DR 500mw radio telemetry kit. This will add another useful feature, allowing me to send updated flight plans from my phone in the field using an open source Android app called 'Tower'. Previously, I'd have to connect my laptop to the Cheerson with a USB cable do the same thing. Aside from the obvious convenience, the real benefit comes from the 'follow me' function of the app. I finally got around to upgrading my drone with custom firmware that will automatically raise and lower the landing gear. However, it didn't work without some rewiring (see photo) and a little bit of mucking about with software. All the effort paid off, as you will see in the video. To test, I held the drone up in the air, first going above 6 feet (sorry no metric, the guy who came up wit the software hack lives in the U.S.) then descending to 'land'. Works well, albeit a little slowly. I would show off by taking the drone out for a flight, but it's gusting in all directions, and I've just finished rebuilding this thing after a nasty crash. I'm playing around with its BRAINS! The Ottawa Maker Faire seemed like a great opportunity to make some 360-degree videos. Instead of resorting to Autopano this time around, I thought I'd see what I could cook up with the Samsung's own Action Director video editor. I played around with some simple transitions, added background music and text. If you don't see the titles, it's because they are down on the 'ground'. That wasn't intentional, but I forgot when editing on a flat image that the text would end up there when mapped to the inside of a sphere. Test Embed of External HMTL5 360 Image Source. I've added some multimedia content to a static image taken last week at the Canadian Aviation Museum. It appears to work fine, but let me know if it doesn't for you. With the a trial copy of Pano2vr (hence the watermark) I've added a floating video frame, an image patch to cover the tripod nadir, added a short audio source that loops twice, and if you click on the astronaut, it will take you to an external site (double-click image for full screen). I'm looking forward to presenting this and other stuff to the j-school New Media class at Carleton U this Friday. Gear 360, House of PainT and taking to the air. I ordered my Samsung Gear 360 not long after I worked out how to stitch videos using the expensive but useful Autopano Video software. Immediately I set about getting busy with it. While I've enjoyed my experience playing around with the Brahma Duo, I'd rather spend more time making content than fussing with the technical challenges of the Duo. My first images were made using a hacked version of the Android app for the Gear 360, which meant I didn't have to upgrade to the latest, greatest Samsung models. I've been holding out for the Samsung Galaxy Note 7, but as you probably know, that has a nasty habit of catching fire, so I need to stick with my phabulous Galaxy Note 4 for a little while longer. Armed with 360 camera, I jumped on my bike and scouted for photo opportunities. Where better than the picturesque campus of my almer mater, Carleton University, Ottawa? There is an attractive stretch of the Rideau river that runs along one side of of the campus. The middle of the river is easily reached at this time of year. I set up the tripod, mounted the camera and scooted off into the foliage. Using the phone app, I triggered the phone to take the following shot. ​It was one of my first using the Gear 360 (aside from an awful close-up of me right after un-packaging) and to date, it has the most online views. At the time of writing, the photo had attracted a stupendous 368,000 views on Google Streetview. I don't know why exactly — perhaps it's the novelty factor. I also shot some video, hoping to show off the 4K capabilities of the camera, but neglected to set it to the highest resolution. Even so, it's not bad. You can view it here. Surprisingly, the phone app handled all the stitching with a minimum of time and bother. You'll note that in the photos and the video, there is a colour and exposure mismatch that can be quite pronounced in certain lighting conditions. The last camera update was supposed to have fixed it, but many Gear 360 owners, including myself, will say differently. As you can see, aside from some of the flaws that I've highlighted already, the camera does a fine job and the app is remarkably good at stitching. For safety reasons, I set the flight plan to stay over the river for most of the time. If it ditches in the river, at least I haven't injured anyone (I made sure the water was clear of paddle boarders). It's clear the landing gear is a problem for 360 video, even more that I expected. Not long after this flight I visited Banggood.com and ordered some retractable landing gear. While I was waiting for that, I focused my energies on learning more about making the most of 360 multimedia, with journalism applications in mind. Not long ago, the annual House ofPainT festival was on in Ottawa, and one Saturday night I cycled over to the Dunbar bridge to record some video the live performances and the dance competitions. And of course, the graffiti art that had been created for the occasion. Lessons learned: First, the camera doesn't handle low-light condition well. But it struggled to automatically set exposure levels for the brightly-lit stage against darker areas. Perhaps the Nikon Keymission 360 will do a better job when it's out next month. To improve the quality of the footage, I went back to Autopano Video v2.3 to do the stitching and rendering. It was a definite improvement over the results obtained using Samsung's own Action Director software. As a freelance journalist, I spend plenty of time sitting on my bum writing, and I prefer to do that outside of the home to promote discipline and productivity. Black Squirrel Books is my preferred workspace. I decided to capture the moment one morning as I put the final edits in place for my story on a new portable DNA testing device for Motherboard. I have the new landing gear, but managed to crash the drone badly before I was able to get any 360 video, so that will stay on hold for a while longer. I'll post a little bit about that in the next few days. I stitched raw Samsung Gear 360 video with Autopano Video 2.3 on a Mac. There' a pact you make with yourself when you take the road less travelled in tech. I'd be well pleased to have the liquidity to stump up a few thousand dollars for a state-of-the-art 360 camera, but I must make do with much less than that. Indeed, it's whatever I can cobble together at the moment. That's why I've gone with the Brahma Duo. It's cheap for what you get. But you must sing for your supper to achieve the best results. Meaning countless hours spent mucking about with scripts, custom firmware, trawling forums and learning esoteric commands. I've actually telneted (is that a word?) to my cameras, just to squeeze a little extra colour and clarity out of it. The remote camera control android app is a side-project for a very busy chap somewhere in the U.K. — he's done an excellent job, but it's an alpha version. Sometimes you are lucky if it takes one video out of four attempts. Maybe only one camera will record. For this reason, you must remember to constantly restart the cameras, restart the software and occasionally reboot the phone. It's the classic 'IT Crowd' solution. ​At the end of it, you'll sometimes come up with something like this. But as much as I've had fun hacking and tinkering on the ground floor of 360 multimedia, it's already time to move up. My aspirations extend to better quality imagery, at least 4K, so my footage for will be at the minimum required for what I believe is demanded by truely immersive story telling. But my budget certainly won't extend up to a 5,000 dollar, six-camera GoPro rig. That said, there is a contender that won't laser a hole through my wallet. The Samsung Gear 360, which looks like a giant robot eyeball, is a 360 camera that does 4K and is affordable. While the camera is only available in Korea at the moment, you can pre-order it on eBay from Korean sellers for about 320 to 400 dollars. From all the reviews I've read so far, Samsung is on to a winner here. This could be the Tesla Model 3 of the 360/VR camera world, the content creation device that really takes VR to the mainstream. Of course, there is the Ricoh Theta S, which I must say is an amazingly compact and capable package for what it can do. Unfortunately, it doesn't quite deliver in terms of image and video quality. As with all good things, there is a catch. Actually, more than one. First, Samsung have made it so the camera can only be controlled by Samsung phones. Plus, the stitching software that glues the camera's dual images together will only run on these phones, or on a reasonably powerful Windows PC. So sorry Mac fans, this is Samsung sticking it to you for your devotion to fruit-branded consumer tech. To stitch my Brahma Duo camera videos together, I purchased a licence for the very expensive, but very excellent 360 camera video stitching software from virtual reality company, Kolor. Autopano Video 2.3 is so good, it's almost worth the money. Almost. But it's arguably the best you can get at the moment, which certainly hasn't been lost on Kolor. I run it on my Macbook, which isn't ideal for big rendering jobs, but it's what I have. There are no Windows PCs in this household. SO, while I'd love to move up to a Gear 360, I DON'T want to buy a PC so I can stitch and render footage. My phone is a Samsung Galaxy Note 4, but it's not compatible with the Gear 360 Manager app (Supported devices are: Galaxy S7, Galaxy S7 Edge, Galaxy S6, Galaxy S6 Edge, Galaxy S6 Edge +, Galaxy Note 5). Double downer. It looked as though I was royally screwed. No robot eyeball for me. BUT, as always, there is a hacked version of the app that WILL run on my Note 4, albeit with some bugs to iron out. Which got me thinking. If I can control the Gear 360 with my phone, what if I could make Autopano Video do the stitching and rendering? I could expect no help from Kolor, as they are now recently acquired by GoPro and not interested in helping out the competition. And likewise from Samsung, for the same reasons. However, where there is a will, there is a solution. Using some Gear 360 footage provided by Mic Ty from the 360 Rumors blog, I managed to come up with a template pano that I can use for stitching Gear 360 footage in the future. My first effort is a little rough and needs further refinement, but as a proof-of-concept, it works well enough. It means that I can keep using Autopano Video, I won't have to buy a PC yet (I may have to anyway if I don't want to spend 5 hours rendering a 7 minute video) and best of all, I can get myself a robot eyeball! I'll detail the steps I took to create the pano in a later post. I've embedded the test video below. It's scintillating stuff. Oh, and thanks again Mic for the source video! And thanks to Bin4ry for the modified Gear 360 Manager! Here is the rig mounted on my helmet. Note the elastic bands. I will be sourcing a better mount. I've decided to gain some experience with creating 360° and virtual reality immersive multimedia. As a journalist, my focus will be on exploring the best way to exploit this technology to bring stories to life and better engage a new generation of digital native. I'm starting cheap. Very cheap in fact. The camera I've built is based on designs from U.K.-based developer and multimedia specialist, Stephen Jones. At the bottom end of his range of DIY designs is the Brahma Duo. It comprises of a 3D-printed chassis that holds two Xiaomi Yi action cameras back-to-back. To ensure a full 360°x360° field of view, I modified the cameras with two 220° lenses. The videos and photos produced by each camera are joined together using software (Autopano Video 2.3) to create the final rendered 360° product. In future posts I'll write in more detail about the experience of building the rig and using the software. For now, I'm learning to use both. Below is an example of my first tests with the rig. Important Note: view the video with either Chrome or Firefox to get the full 360° experience. Safari doesn't support 360 at the present time. And set the resolution as high as it will go. Enjoy!